The LFB championship play-off series for the title of the French Champions will be contested by only four teams this season. The teams will play in a best of three series with the team placed higher at the regular season having home advantage if a third game is required. Bourges Basket only dropped one game all season and captured the regular season title for the first time under the reign of Pierre Vincent as head coach. The last time Bourges finished first at the end of the regular season was in 1999-2000. USVO finished second with six games behind Bourges. After a good start to the season, the hope of defending their regular season title was dented by defeats against Bourges and Mondeville. USVO's qualification for the championship play-off was never in doubt despite several defeats during the second phase. Lattes-Montpellier has had injury problems all season and has never been able to field their strongest side. A LFB 10-game-winning streak from the end of December until February catapulted them into third position. They finished with the same record than USVO and only lost second place on the head to head record between the two clubs. 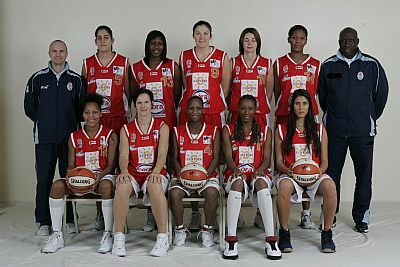 Villeneuve d'Ascq (team photo above) was the team of March and won the unofficial crown of the LFB March madness champions. They climbed from 10th place to 4th and also qualified for the final of the Coupe de France (French cup). They struggled to maintain the same form in April and have been unlucky with injuries. All the games during the semi-final will be streamed live on LFB-TV. The full match time-table with the relevant links will also be on our LFB- TV page with the date and time of the matches. 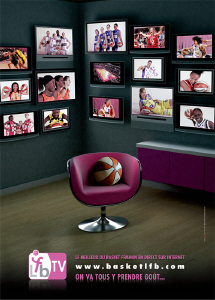 The first semi-final series is between Bourges Basket and Villeneuve d'Ascq. Bourges Basket have beaten Villeneuve in all three meetings this season and will start the series as favourites. The key match-up in the series will be between Céline Dumerc and Kathy Wambe who will be facing off against each other. Géraldine Robert (left) is one of the most explosive players in the LFB and is a handful t the best of times in the paint. So her battle with Endeme Miyem from Bourges will be interesting, too. Belinda Snell and Luba Drljaca are the players from each side that can turn the match in their team's favour. The first match of the series will be played on Friday, the 25th April, at Villeneuve. In the second semi-final series Montpellier will play the defending champions USVO. With the recent news that USVO and Saint Amand may merge next season USVO's the final preparation has not been ideal. USVO have had the advantage over Montpellier this season in winning all their encounters. For USVO Emilie Gomis and Francesca Zara have combined well in their matches against Montpellier this season. The hope is that they repeat their performance from the Tournoi de la Fédération to give their club the advantage. For Montpellier all eyes will be on Gunta Basko (left). She is the locomotive of the team. When she is firing on all cylinders the rest of the team picks up. Grace Daley has been resting her ankle. If she is at 100% then with Basko, Montpellier have the armoury to take on UVSO. The key match-up will be in the paint with Sandra Dijon and Nicole Ohlde. The winner of this battle could decide the series. The players to watch who can turn the match in their team's favour are Sarah Michel from USVO and Katarina Manic from Montpellier.